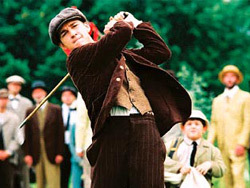 An amateur player from a working class family, Francis Ouimet (Shia LaBeouf) shocked the golf world when at the 1913 U.S. Open, flanked by his 10-year-old caddie, he defeated his idol, the defending British champion Harry Vardon (Stephen Dillane). An unlikely match-up - the ingenue versus the seasoned champ - theirs was the greatest match the sport had ever known. Caught between a world of hardship and a beckoning life of privilege, Francis needed to prove his unfailing will and ability to make it to the tournament. Elias Koteas plays Francis' tough, hardworking father. Newcomer Peyton List is Sarah Wallis, the beautiful young woman, who catches Francis' heart. Joshua Flitter is Eddie Lowery, the pint sized caddie who helps Francis find his way through the troublesome fairways to victory.